Google has recently discontinued Quick Search Box for Windows, which was included in Google Toolbar. 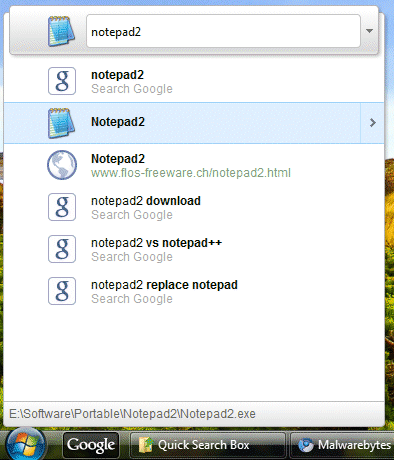 If you liked the application, there's a way to use it, even if it's no longer available in Google Toolbar. 1. If you already have Google Toolbar for IE, it's likely that the toolbar has been updated to the latest version and you need to uninstall it. Just click the arrow next to the Google Toolbar wrench and select "Uninstall". 2. Install an older version of Google Toolbar for IE (6.3). 3. Now you can install the latest version of Google Toolbar from toolbar.google.com or wait until the application updates itself. You can also install the most recent version from FileHippo. I like the Quick Search Box and wish Google would offer a standalone version of it. I think you can also install the Quick Search Box via Google Pack. That's how I re-installed the Quick Search Box after I un-installed the Google Toolbar and reinstalled it, only to find out the Quick Search Box was gone. thank you so much! i had to install google desktop to get this feature without the button. Thank you so much. Honestly I have spent all day looking for alternatives (after spending all last night trying to get QSB back) and none of them really fit me. So happy to have it working again I felt lost without it. I am getting increasingly frustrated with Google's insensitivity to people's preferences. Goggle has suddenly discontinued support for following features: Google screensaver (integrated with Picasa), web history preview in Google home page, and now Google Quick search. Thanks you so much Google for your disregard of your users. The good news is that updating Google Toolbar doesn't remove Quick Search Box. "Right now, if you have Quick Search Box then updating Toolbar will not remove it. Uninstalling Toolbar will also uninstall QSB, and since it's no longer offered with Toolbar you won't be able to get it back unless you install an older version. So no worries about updating Toolbar as long as you don't uninstall first." That's so great! Thank you! I've become so accustomed to this little feature I was so dismayed when they removed it. thanks i was waiting to know this.. Anybody knows how to uninstall the recent Google Toolbar from IE6. I can only disable de component but when I try installing the older version it show me a message telling me that it's imposible installing the component because a newest version is already installed. Please, help me, I can't live without Quick Search Box! Or maybe give me an real alternative to QSB from Google. Uninstall Google Toolbar like any other Windows program: go to Control Panel and find "Add or remove programs" (XP) or "Programs and features" (Vista, 7). Proper Installation of Google Quick Search Box. 1. Download Google Quick Search Box. "googlequicksearchboxsetup.exe /install /bundle=tbie /global /brand=GGLL /hl=en"
Thank you Alex for this great article and to Wisnu for the even easier instructions! Anyone know how to delete entries in the google quick search box on a HTC Evo? Thank you very much, i searched one week finally i got it from your site. I did install the google quick search box application, but I realized that the new Quick Search box included with Google desktop is far better and consumes less resources. Quick Search box seems to be using 35mb of memory at all times vs. Google desktop's version only uses 10mb.. seems to be more lightweight, plus it has more features..
Another day I will write about how you have helped my life. Many thanks for this tip. Works super with Windows 7, 64 bit. Thank you Wisnu Cahya Kartika, I had to run cmd as admin, but then it worked! thanks! i have been looking this for months! Got it ! Finally! Should I disable McAfee Anti- Virus software first before the install? and now with Windows 8 seems didn't work anything -.-"
many thanks for previous help! Hi I would like to upload a standalone portable version of Google Quick Search Box that I got working for me personally. Tested on w7(x86)starter. I do not know about the rest of OS'. So let me know where I can upload to share this that eveyone so wants w/o installing the google toolbar!!! Reguards to Google for making it. I hope this would not be an issue with google cuz I am poor and have no money to pay for cc & etc! I am not making money on this so I guess I am ok! Use a file sharing service like Dropbox and post a link.